Ibrahim M. Hegab, Guoshen Shang, Manhong Ye, Yajuan, et al. Predator odors are non-intrusive natural stressors of high ethological relevance. The objective of this study was to investigate the processing of a chronic, life-threatening stimulus during repeated prolonged presentation to Brandt’s voles. One hundred and twenty voles were tested by repeated presentation of cat feces in a defensive withdrawal apparatus. Voles exposed to feces for short periods showed more avoidance, more concealment in the hide box, less contact time with the odor source, more freezing behavior, less grooming, more jumping, and more vigilant rearing than did non-exposed voles, and those exposed for longer periods. Serum levels of adrenocortico-tropic hormone and corticosterone increased significantly when animals were repeatedly exposed to cat feces for short periods. The behavioral and endocrine responses habituated during prolonged presentation of cat feces. ΔfosB mRNA expression level was highest in voles exposed to cat feces for 6 and 12 consecutive days, and subsequently declined in animals exposed to cat feces for 24 days. We therefore conclude that the behavioral and endocrine responses to repeated exposure to cat feces undergo a process of habituation, while ΔfosB changes in the medial hypothalamic region exhibit sensitization. We propose that habituation and sensitization are complementary rather than contradictory processes that occur in the same individual upon repeated presentation of the same stressor. elicited thereby allowing prey species to recognize, avoid and defend against a possible predation threat. In this review, we will discuss the nature of neuroendocrine stress responses upon exposure to predator odors. Predator odors can have a profound effect on the endocrine system, including activation of the hypothalamic–pituitary–adrenal axis, and induction of stress hormones such as corticosterone and adrenocorticotropic hormone. On a neural level, short-term exposure to predator odors leads to induction of the c-fos gene, while induction of ΔFosB in a different brain region is detected under chronic predation stress. Future research should aim to elucidate the relationships between neuroendocrine and behavioral outputs to gage the different levels of antipredator responses in prey species. Hongli Sun, Ning Jia, Lixia Guan, Qing Su, et al. Prenatal stress (PS) has been shown to be associated with anxiety. However, the underlying neurological mechanisms are not well understood. To determine the effects of PS on anxiety-like behavior in the adult offspring, we evaluated anxiety-like behavior using open field test (OFT) and elevated plus maze (EPM) in the 3-month offspring. Both male and female offspring showed a significant reduction of crossing counts in the center, total crossing counts, rearing counts and time spent in the center in the OFT, and only male offspring showed a decreased percentage of open-arm entries and open-arm time in open arms in the EPM. Additionally, expression of NR1 and NR2A subunit of N-methyl-d-aspartate receptor (NMDAR) in the hippocampus (HIP), prefrontal cortex (PFC) and striatum (STR) was studied. Our results showed that PS reduced NR1 and NR2A expression in the HIP, NR2A expression in the PFC and STR in the offspring. The altered NR1 and NR2A could have potential impact on anxiety-like behavior in the adult offspring exposed to PS. field (OF). The treatment effects on PAG c-Fos immunoreactivity (c-Fos-ir) and corticosterone (CORT) concentration were measured in order to determine the neural endocrine correlates of anxiety-related behaviors and drug treatments. Our results demonstrate that acute BUSP and ESCIT treatments induced anxiogenic behaviors with elevation of CORT compared to the baseline. A decrease of c-Fos-ir was found in the dorsomedial PAG region of both the treatment groups. Correlation analysis showed that the CORT were not associated with the OF anxiogenic behavior and PAG c-Fos-ir. No significant differences were found in behaviors and CORT after chronic treatment. the PAG c-Fos-ir, this does not imply the lack of cause-and-effect relationship between neuroendocrine effects and PAG function in anxiety responses. These correlation studies suggest that the regulation of 5-HT system was probably disrupted by acute 5-HT treatment. Stress is an event that most animals experience and that induces a number of responses involving all three regulatory systems, neural, endocrine and immune. When the stressor is acute and short-term, the response pattern is stimulatory and the fish immune response shows an activating phase that specially enhances innate responses. 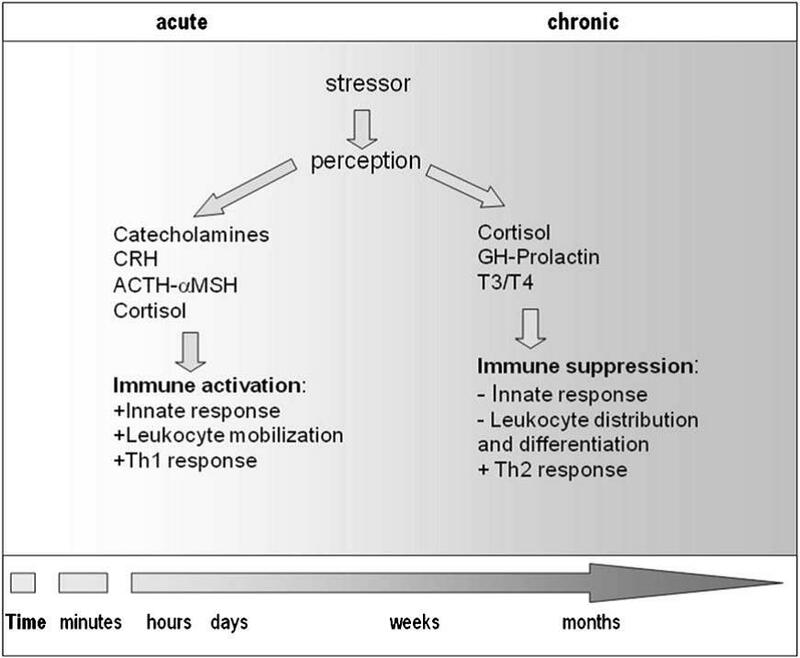 If the stressor is chronic the immune response shows suppressive effects and therefore the chances of an infection may be enhanced. In addition, coping with the stressor imposes an allostatic cost that may interfere with the needs of the immune response. In this paper the mechanisms behind these immunoregulatory changes are reviewed and the role of the main neuroendocrine mechanisms directly affecting the building of the immune response and their consequences are considered. Stress is a general term proposed by Hans Selye in 1953 (Selye, 1953) applying to a situation in which a person or an animal is subjected to a challenge that may result in a real or symbolic danger for its integrity. The stress response applies to a wide range of physiological mechanisms, including gene and protein changes, metabolism, energetics, immune, endocrine, neural and even behavioral changes that will first try to overcome that situation and then compensate for the imbalances produced by either the stressor or the consequences generated by the first array of responses. may be assumed that this response has common traits along the phylogenetic tree. Thus, responses such as the fight and flight reaction and therefore the repertoire of energetic arrangements to serve the surplus of activity are observed in all animals. For instance, in terms of molecular responses, the increase in heat shock proteins is observed from invertebrates to fish to humans; the induction of acute phase proteins is also a common trait. A variety of immune changes have been described after applying different kinds of stressors in fish. Hence, both activating and suppressive processes have been described following stress episodes, although the majority of changes often result in deleterious effects. Immediate responses during the activation phase enhance innate humoral immunity such as increased levels of lysozyme and C3 proteins after acute stress or the increase of the number of myeloid-type leukocytes in the peritoneum after intraperitoneal bacterial injection. Moreover, glucocorticoid receptor sites increase in head kidney leukocytes after acute handling stress. Longer term treatments normally show suppressive effects: Sea bass subjected to crowding stress show reduced immunocompetence, as shown by reduced rates of cytotoxicity and chemiluminescence. A decrease of complement activity, lysozyme levels, agglutination activity and antibody titers is observed after 3 days onwards after repeated stress in sea bream. Stress reduces the number of circulating B-lymphocytes, and decreases the antibody response after immunization in vivo. 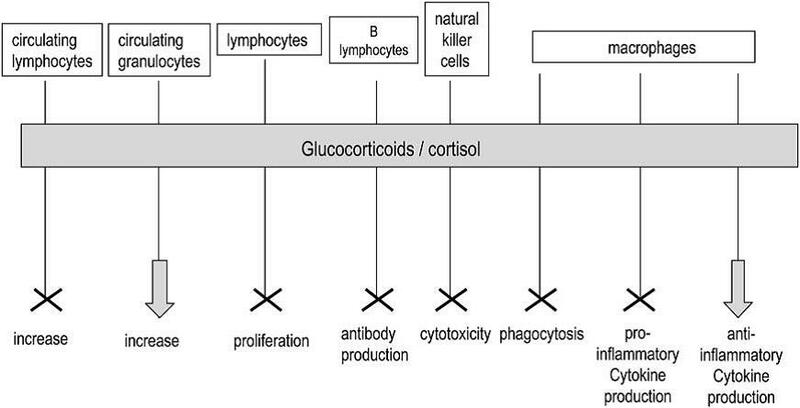 Effects of cortisol on cell immune responses. The arrow indicates permissive and the cross indicates suppressive. 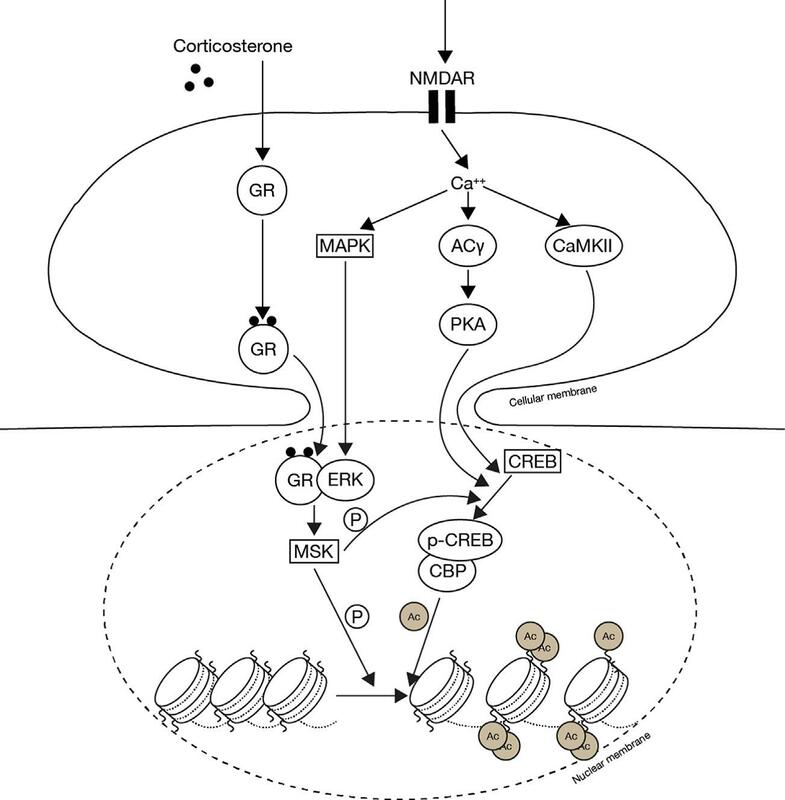 Neuroendocrine response to stress after perception by the sensors of the nervous system involves the immediate secretion of corticosteroid releasing hormone (CRH) by the preoptic nucleus of the hypothalamus. The stimulated CRH receptors in the corticotropic cells of the pituitary gland induce release of adrenocorticotropic hormone (ACTH) into the circulation that subsequently stimulates release of cortisol by the head kidney interrenal cells. ACTH as well as melanocyte-stimulating hormone (α-MSH) are derived from cleavage of the pro-opiomelanocortin gene product. In most fishes this hormone releasing sequence is taking place in seconds for CRH, seconds to minutes for ACTH, and minutes for cortisol. Since the effect of corticosteroids is exerted in most tissues, a number of studies looking at the consequences of cortisol release on the immune system have been performed but less work has been done on its precursors. (b) their interaction modulates and fine tunes the initial response to avoid excessive activation and adapting resources to the specific challenge. These interactions will not only serve for any particular stress episode but also for adapting and preparing the response for future challenges. (3) density of PVH-targeted axons immunoreactive for the feeding control peptides Agouti-related peptide and α-melanocyte-stimulating hormone (αMSH). (2) rats may compensate for a loss of CA innervation to the ARH and PVH by increased expression of αMSH. These findings highlight the existence of a hierarchical dependence for ARH responses to neural and humoral signals that influence feeding behavior and metabolism. Inflammatory pain experienced on the day of birth (postnatal day 0: PD0) significantly dampens behavioral responses to stress- and anxiety-provoking stimuli in adult rats. However, to date, the mechanisms by which early life pain permanently alters adult stress responses remain unknown. 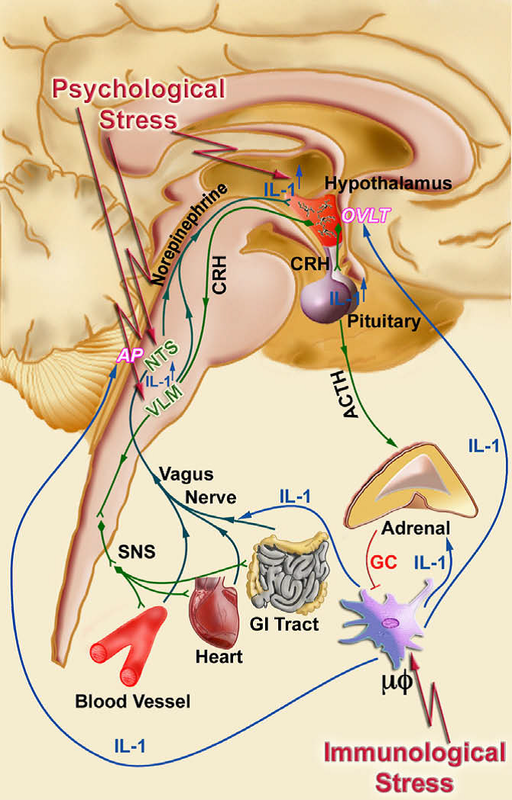 The present studies examined the impact of inflammatory pain, experienced on the day of birth, on adult expression of receptors or proteins implicated in the activation and termination of the stress response, including corticotrophin releasing factor receptors (CRFR1 and CRFR2) and glucocorticoid receptor (GR). Using competitive receptor autoradiography, we show that Sprague Dawley male and female rat pups administered 1% carrageenan into the intraplantar surface of the hindpaw on the day of birth have significantly decreased CRFR1 binding in the basolateral amygdala and midbrain periaqueductal gray in adulthood. In contrast, CRFR2 binding, which is associated with stress termination, was significantly increased in the lateral septum and cortical amygdala. GR expression, measured with in situ hybridization and immunohistochemistry, was significantly increased in the paraventricular nucleus of the hypothalamus and significantly decreased in the hippocampus of neonatally injured adults. In parallel, acute stress-induced corticosterone release was significantly attenuated and returned to baseline more rapidly in adults injured on PD0 in comparison to controls. Collectively, these data show that early life pain alters neural circuits that regulate responses to and neuroendocrine recovery from stress, and suggest that pain experienced by infants in the Neonatal Intensive Care Unit may permanently alter future responses to anxiety- and stress provoking stimuli. The impact of acute stress on inflammatory signaling within the central nervous system is of interest because these factors influence neuroendocrine function both directly and indirectly. Exposure to certain stressors increases expression of the proinflammatory cytokine, Il-1 in the hypothalamus. 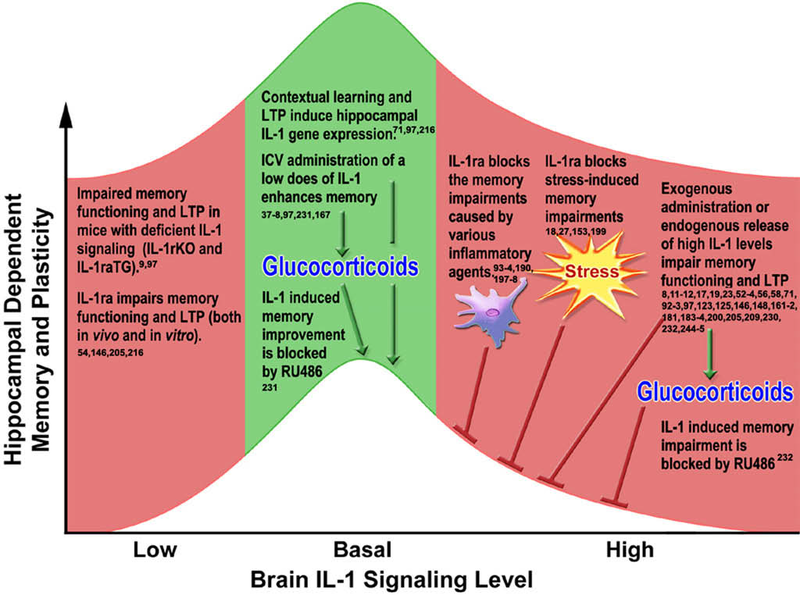 Increased IL-1 is reciprocally regulated by norepinephrine (stimulatory) and corticosterone (inhibitory), yet neural pathways underlying increased IL-1 have not been clarified. These experiments explored the impact of bilateral lesions of the ventral noradrenergic bundle (VNAB) on IL-1 expression in the paraventricular nucleus of the hypothalamus (PVN) after foot shock. Adult male Sprague Dawley rats received bilateral 6-hydroxydopamine lesions of the VNAB (VNABx) and were exposed to intermittent foot shock. VNABx depleted approximately 64% of norepinephrine in the PVN and attenuated the IL-1 response produced by foot shock. However, characterization of the hypothalamic-pituitary-adrenal response, a crucial prerequisite for interpreting the effect of VNABx on IL-1 expression, revealed a profound dissociation between ACTH and corticosterone. Specifically, VNABx blocked the intronic CRH response in the PVN and the increase in plasma ACTH, whereas corticosterone was unaffected at all time points examined. Additionally, foot shock led to a rapid and profound increase in cyclooxygenase-2 and IL-1 expression within the adrenal glands, whereas more subtle effects were observed in the pituitary gland. 3) suggestion of an ACTH-independent mechanism controlling the release of corticosterone in VNABx rats. are possible in different parts of the brain following stress. Although present evidence points to changes in BDNF transcription being the major causal agent for the changes in spine density in different parts of the brain following stress, steroids have significant effects on downstream pathways from the TrkB receptor once it is acted upon by BDNF, including those that modulate the density of dendritic spines. Finally, although glucocorticoids play a canonical role in determining BDNF modulation of dendritic spines, recent studies have shown a role for corticotrophin releasing factor (CRF) in this regard. There is considerable improvement in the extent of changes in spine size and density in rodents with forebrain specific knockout of CRF receptor 1 (CRFR1) even when the glucocorticoid pathways are left intact. It seems then that CRF does have a role to play in determining BDNF control of dendritic spines. there. The most likely cause of these changes is provided by the stress initiated release of steroids, which readily enter neurons and alter gene expression, for example that of BDNF. Of particular interest is how glucocorticoids and mineralocorticoids tend to have opposite effects on BDNF gene expression offering the possibility that differences in the distribution of their receptors and of their downstream effects might provide a basis for the differential transcription of the BDNF genes. Alternatively, differences in the extent of methylation and acetylation in the epigenetic control of BDNF transcription are possible in different parts of the brain following stress. Structure of the rodent BDNF gene. Exons are represented as boxes and the introns as lines. Numbers of the exons are indicated in Roman numerals. The coding exon (exon IX) contains two polyadenylation sites (poly A). The start codon (ATG) that marks the initiation of transcription is indicated. The red box shows the region of exon IX coding for the pro-BDNF protein. Some exons, like exon II and IX, contain different transcript variants with alternative splice-donor sites. Also shown is part of the BDNF exon IV sequence in adults with adverse infant experiences showing cytosine methylation (M) at three of the 12 CG dinucleotide sites (numbered with superscripts). See Boulle et al. (2012). Epigenetic mechanism associated with repression and activation of BDNF exon IV transcription. Epigenetic mechanism associated with repression and activation of BDNF exon IV transcription. The BDNF exon IV displays 12 distinct CpG sites, which can be methylated and interact selectively with MeCp2 to form complexes that repress gene transcription (see also Fig. 1). 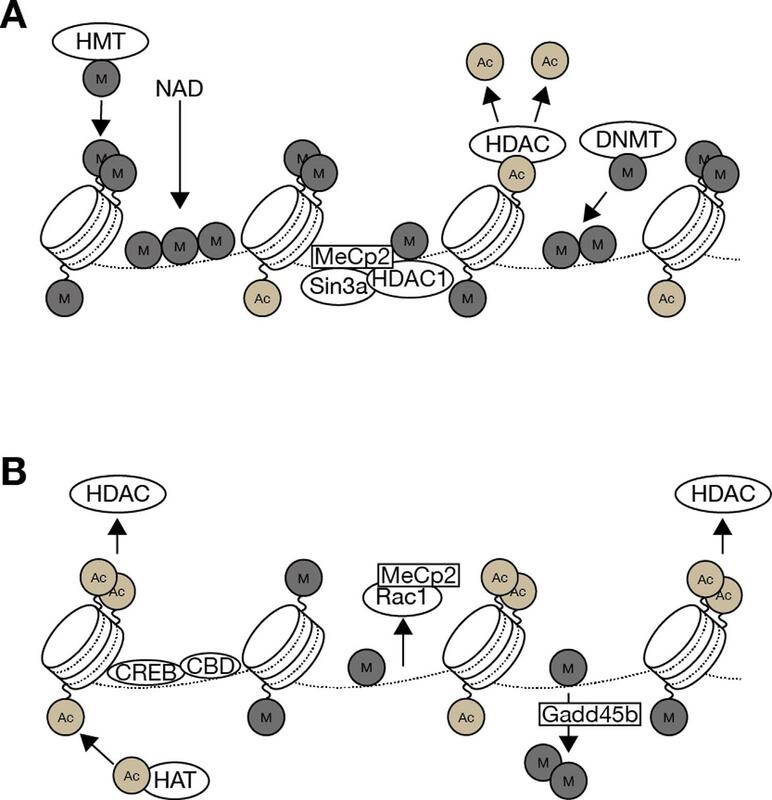 Histone methyltransferases (HMT) are responsible for adding methyl groups at histone tails (Panel A), whereas histone deacetylases (HDAC) remove acetylation at histone tails (Panel B), both processes that repress gene transcription. Moreover, low levels of nicotinamine adenine dinucleotide (NAD) promote DNA methylation at the BDNF locus. BDNF gene activation is associated with increased histone H3 and H4 acetylation, which is mediated by histone acetyl transferase (HAT) activity. DNA demethylation might be facilitated by growth arrest and DNA damage proteins such as Gadd45b. An increased binding of CREB to its specific binding protein, CREB binding protein (CBP), is also associated with an increase in BDNF gene transcription. See Boulle et al. (2012). Schematic representation of the signaling and epigenetic pathways in granule neurons of the dentate gyrus thought to be involved in the consolidation process of memory formation after a psychologically stressful challenge. Activation of NMDAR results in stimulation of the MAPK/ERK signaling cascade, the AC /PKA cascade and the CaMKII cascade. In conjunction with activated GR these signaling cascades result in the activation of MSK and ERK leading to the formation of dual histone acetylation marks along the c-Fos promoter and subsequently induction of gene transcription. Signaling via CREB also leads to the same outcome. The induction of gene transcription is thought to be instrumental in the consolidation of memory formation in various stressful learning events. See Trollope et al. (2012). changes in chromatin structure results in transcriptional gene silencing in the hippocampus. H3K9me2 dimethylation is associated with transcriptional silencing (not shown). 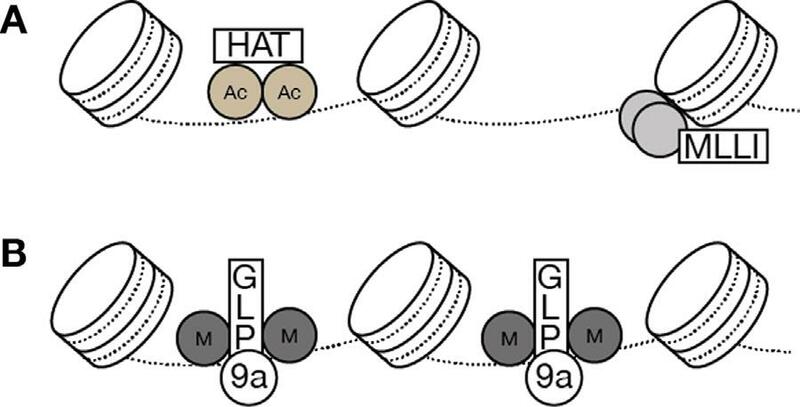 The G9a/GLP complex methyltransferase is specific for producing this modification. Abbreviations: Ac, acetylation; M, methylation; MLLI, histone H3 lysine 4 methyltransferase (which regulates memory formation); H3K9me2, histone H3 lysine 9 dimethylation; HAT, histone acetyltransferase; G9a/GLP, G9a/G9a-like protein (GLP) complex methyltransferase. Modification of serotonin reuptake transport, with inhibitors such as fluoxetine, augments BDNF exon I mRNA levels in the BLA as well as in the hippocampus. This augmentation is lost and replaced by a decrease in BDNF levels if the mice are homozygous for the BDNF Val66Met SNP. A better outcome is obtained for erasing fear memories in PTSD subjects than using D-cycloserine if a combination is used of extinction training with chronic fluoxetine treatment that augments BDNF exon I mRNA. The following points are suggested by the present review on identifying the changes in dendritic spine synapses in neural networks under stress, the mechanisms that drive these, and how these networks can be reinstated to normality. Activation of BDNF leads to the sprouting of dendrites in many areas of the brain, such as CA1 in the hippocampus. As glucocorticoids decrease BDNF expression they decrease dendritic spine density in these areas . Thus activation of both GR and MR with corticosterone leads to an increase in dendritic spine turnover on pyramidal neurons in these areas. In other areas of the brain glucocorticoids do not have this. Extinction of a fear memory, such as, of the negative effects of opiate withdrawal, involves increases of BDNF mRNA and protein in the ventromedial prefrontal cortex, through the action of CREB at histone H3 of the BDNF exon I transcript promoter with acetylation of the histone. This could be enhanced before extinction training with histone deacetylase inhibitors such as trichostatin A or inhibitors such as U0126 of ERK. Major risk factors for PTSD are low levels of cortisol in the blood immediately after the trauma occasion; and before the trauma, in peripheral blood mononuclear cells, the presence of high GR numbers, low FKBP5 expression, and high levels of GILZ mRNA. All of these risk factors are involved in the action of cytoplasmic GR in modulating gene transduction, including most likely that for the BDNF gene, as well as regulating the capacity for BDNF itself to act. This emphasis on GR in PTSD is enforced by the observations that there is an association between two polymorphisms in the GR gene (N363S and Bcl1) and PTSD as there is between that of FKBP5 and GILZ on the one hand and the capacity of GR to modulate gene function on the other. in neurons of the basolateral amygdala (BLA) following CSDS and showed exaggerated conditioned fear responses, while there were no significant differences between groups in innate anxiety- and depressive-like behaviors. Through the use of conditional brain-derived neurotrophic factor (BDNF) knockout strategies, we find that elevated BLA BDNF level following fear conditioning training is a key mediator contributing to determine the levels of conditioned fear responses. Our results also show that relative to susceptible mice, resistant mice had a much faster recovery from conditioned stimuli-induced cardiovascular and corticosterone responses. Systemic administration of norepinephrine reuptake inhibitor atomoxetine increased c-Fos protein expression in BLA neurons following fear conditioning training and promoted the expression of conditioned fear in resistant mice. Conversely, administration of β-adrenergic receptor antagonist propranolol reduced fear conditioning training-induced c-Fos protein expression in BLA neurons and reduced conditioned fear responses in susceptible mice. These findings reveal a novel role for the BDNF signaling within the BLA in mediating individual differences in autonomic, neuroendocrine and behavioral reactivity to fear conditioning. Intl J Neuropsychopharmacology (2013), 16, 105–120. on anxiety-like behavior, food intake and corticosterone secretion. We demonstrate that MC4R-expressing neurons in the MeA were activated by acute restraint stress, as indicated by induction of c-fos mRNA expression. Infusion of a selective MC4R agonist into the MeA elicited anxiogenic-like effects in the elevated plus-maze test and decreased food intake. Local MeA infusion of SHU 9119, an MC4R antagonist, on the other hand, blocked restraint stress-induced anxiogenic and anorectic effects. Moreover, plasma corticosterone levels were increased by intra-MeA infusion of the MC4R agonist under non-stressed conditions and restraint stress-induced elevation of plasma corticosterone levels was attenuated by pretreatment with SHU 9119 in the MeA. Thus, stimulating MC4R in the MeA induces stress-like anxiogenic and anorectic effects as well as activation of the HPA axis, whereas antagonizing MC4R in this region blocks such effects induced by restraint stress. Together, our results implicate MC4R signaling in the MeA in behavioral and endocrine responses to stress. of animals and their fear response, and increases stress-induced analgesia. a role in maintaining body temperature in a cold environment via descending excitatory pathways from the preoptic area. Anatomical and functional studies also implicated the TIP39-PTH2R system in nociceptive information processing. Finally, TIP39 induced in postpartum dams may play a role in the release of prolactin during lactation. Potential mechanisms leading to the activation ofTIP39 neurons and how they influence the neuroendocrine system are also described. The unique TIP39-PTH2R neuromodulator system provides the possibility for developing drugs with a novel mechanism of action to control neuroendocrine disorders. Nina Alexander, T Klucken, G Koppe, R Osinsky, B Walter, et al. Background: Gene by environment (GE) interaction between genetic variation in the promoter region of the serotonin transporter gene (serotonin transporter-linked polymorphic region [5-HTTLPR]) and stressful life events (SLEs) has been extensively studied in the context of depression. Recent findings suggest increased neural and endocrine stress sensitivity as a possible mechanism conveying elevated vulnerability to psychopathology. Furthermore, these GE mediated alterations very likely reflect interrelated biological processes. Methods: In the present functional magnetic resonance imaging study, amygdala reactivity to fearful stimuli was assessed in healthy male adults (n44),who were previously found to differ with regard to endocrine stress reactivity as a function of 5-HTTLPRSLEs. 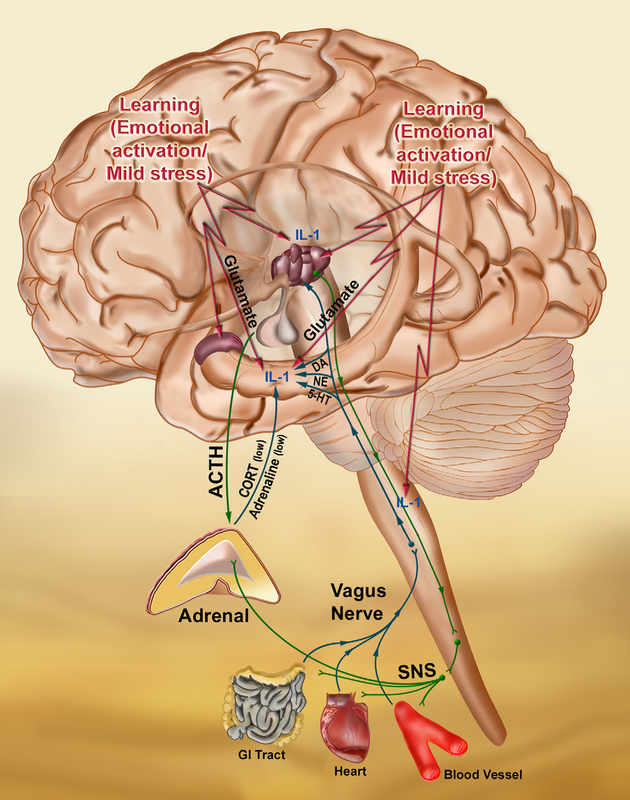 Furthermore, functional connectivity between the amygdala and the hypothalamus was measured as a potential mechanism linking elevated neural and endocrine responses during stressful/threatening situations. The study sample was carefully preselected regarding 5-HTTLPR genotype and SLEs. 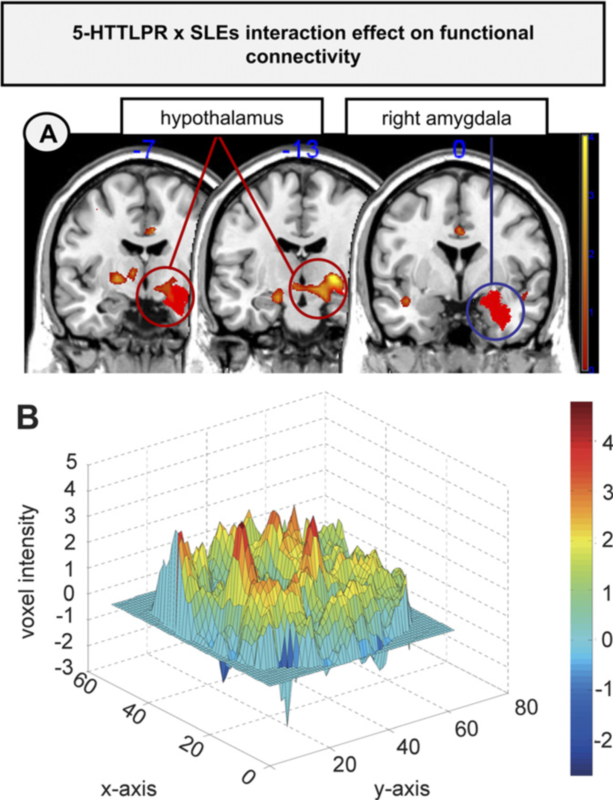 Results: We report significant GE interaction on neural response patterns and functional amygdala-hypothalamus connectivity. Homozygous carriers of the 5-HTTLPR S’ allele with a history of SLEs (S’S’/high SLEs group) displayed elevated bilateral amygdala activation in response to fearful faces. Within the same sample, a comparable GE interaction effect has previously been demonstrated regarding increased cortisol reactivity, indicating a cross-validation of heightened biological stress sensitivity. Furthermore, S’S’/high SLEs subjects were characterized by an increased functional coupling between the right amygdala and the hypothalamus, thus indicating a potential link between neural and endocrine hyperreactivity. Amygdala reactivity to fearful faces as a function of the serotonin transporter-linked polymorphic region (5-HTTLPR) stressful life events (SLEs). The color bar depicts t values for the gene by environment interaction effect. For illustration reasons, the data were thresholded with a t value at 2.5 (see color bar for exact t values). We report a significant 5-HTTLPRxSLEs interaction effect on bilateral amygdala reactivity to fearful faces in a sample of healthy male adults. As hypothesized, S’S’/high SLEs individuals appeared to be most reactive, which can be interpreted in terms of elevated amygdala reactivity to briefly presented (phasic) aversive stimuli. Interestingly, we have observed a similar response pattern regarding cortisol reactivity to acute stress within the same sample, indicating a cross-validation of neuroendocrine hyperreactivity to threatening/stressful stimuli as a function of 5-HTTLPRxSLEs. to date could not replicate these findings. (blue circle, right figure) and the hypothalamus (red circles). The middle figure depicts significant differences in activation patterns between the S’S’/high stressful life events (SLEs) and the L’/low SLEs groups and the left figure displays significant differences between S’S’/high SLEs and S’S’/high SLEs subjects. For illustration reasons, threshold was t =2.5 b (below). (B) Surface plot of functional connectivity at the z-slice location of the peak coordinate. Voxel intensities are given in t values. 5-HTTLPR, serotonin-transporter-linked polymorphic region. In conclusion, we report increased amygdala responsivity to aversive stimuli in healthy S’S’/high SLEs subjects who have previously been shown to display elevated cortisol secretion in response to psychosocial stress. Thus, our findings contribute to the current debate on potential mechanisms mediating susceptibility for the development of psychiatric disorders as a function of 5-HTTLPRxSLEs. Moreover, the present study extends previous findings by demonstrating altered functional coupling between the amygdala and the hypothalamus, thus indicating a potential link between threat/stress related neural and endocrine alterations associated with 5-HTTLPR x SLEs. Valeria Carola, Giovanni Frazzetto, Tiziana Pascucci, Enrica Audero, et al. Background: A polymorphism in the serotonin transporter (5-HTT) gene modulates the association between adverse early experiences and risk for major depression in adulthood. Although human imaging studies have begun to elucidate the neural circuits involved in the 5-HTT environment risk factor, a molecular understanding of this phenomenon is lacking. Such an understanding might help to identify novel targets for the diagnosis and therapy of mood disorders. To address this need, we developed a gene-environment screening paradigm in the mouse. Methods: We established a mouse model in which a heterozygous null mutation in 5-HTT moderates the effects of poor maternal care on adult anxiety and depression-related behavior. Biochemical analysis of brains from these animals was performed to identify molecular substrates of the gene, environment, and gene environment effects. Results: Mice experiencing low maternal care showed deficient ϒ-aminobutyric acid–A receptor binding in the amygdala and 5-HTT heterozygous null mice showed decreased serotonin turnover in hippocampus and striatum. Strikingly, levels of brain-derived neurotrophic factor (BDNF) messenger RNA in hippocampus were elevated exclusively in 5-HTT heterozygous null mice experiencing poor maternal care, suggesting that developmental programming of hippocampal circuits might underlie the 5-HTT environment risk factor. Conclusions: These findings demonstrate that serotonin plays a similar role in modifying the long-term behavioral effects of rearing environment in diverse mammalian species and identifies BDNF as a molecular substrate of this risk factor. In summary, we have produced a mouse model of the 5-HTT environment risk factor for human depression and have used this model to identify molecular substrates underlying this risk factor. Elevated GABA-A receptor expression in amygdala, decreased 5-HT turnover in hippocampus, and enhanced BDNF expression in hippocampus each correlated significantly with the behavioral phenotype seen in our mice. In particular, increased expression of BDNF in CA1 pyramidal neurons was found in mice with reduced 5-HTT function and exposed to low maternal care. This defect was accompanied by an increased bias in the response to threatening cues as assessed by ambiguous cue fear conditioning. Our data suggest that alterations in hippocampal gene expression and function underlie at least part of the interaction between 5-HTT and rearing environment and point to a role for this structure in the increased anxiety and depression-related behavior that is a risk factor for major depression. Nina Alexander, Yvonne Kuepper, Anja Schmitz, Roman Osinsky, et al. Background: Growing evidence suggests that the serotonin transporter polymorphism (5-HTTLPR) interacts with adverse environmental influences to produce an increased risk for the development of depression while the underlying mechanisms of this association remain largely unexplored. As one potential intermediate phenotype, we investigated alterations of hypothalamic—pituitary—adrenal (HPA) axis responses to stress in individuals with no history of psychopathology depending on both 5-HTTLPR and stressful life events. Methods: Healthy male adults (N = 100) were genotyped and completed a questionnaire on severe stressful life events (Life Events Checklist). To test for gene-by-environment interactions on endocrine stress reactivity, subjects were exposed to a standardized laboratory stress task (Public Speaking). Saliva cortisol levels were obtained at 6 time points prior to the stressor and during an extended recovery period. Results: Subjects homozygous for the s-allele with a significant history of stressful life events exhibited markedly elevated cortisol secretions in response to the stressor compared to all other groups, indicating a significant gene-by-environment interaction on endocrine stress reactivity. No main effect of either 5-HTTLPR (biallelic and triallelic) or stressful life events on cortisol secretion patterns appeared. Conclusion: This is the first study reporting that 5-HTTLPR and stressful life events interact to predict endocrine stress reactivity in a non-clinical sample. Our results underpin the potential moderating role of HPA-axis hyper-reactivity as a premorbid risk factor to increase the vulnerability for depression in subjects with low serotonin transporter efficiency and a history of severe life events. The brain, endocrine, and immune systems are inextricably linked. Immune molecules have a powerful impact on neuroendocrine function, including hormone–behavior interactions, during health as well as sickness. Similarly, alterations in hormones, such as during stress, can powerfully impact immune function or reactivity. These functional shifts are evolved, adaptive responses that organize changes in behavior and mobilize immune resources, but can also lead to pathology or exacerbate disease if prolonged or exaggerated. The developing brain in particular is exquisitely sensitive to both endogenous and exogenous signals, and increasing evidence suggests the immune system has a critical role in brain development and associated behavioral outcomes for the life of the individual. Indeed, there are associations between many neuropsychiatric disorders and immune dysfunction, with a distinct etiology in neurodevelopment. The goal of this review is to describe the important role of the immune system during brain development, and to discuss some of the many ways in which immune activation during early brain development can affect the later-life outcomes of neural function, immune function, mood and cognition. Schizophrenia is a severe mental illness that afflicts nearly 1% of the world’s population. One of the cardinal pathological features of schizophrenia is perturbation in synaptic connectivity. Although the etiology of schizophrenia is unknown, it appears to be a developmental disorder involving the interaction of a potentially large number of risk genes, with no one gene producing a strong effect except rare, highly penetrant copy number variants. The purpose of this review is to detail how putative schizophrenia risk genes (DISC-1, neuregulin/ErbB4, dysbindin, Akt1, BDNF, and the NMDA receptor) are involved in regulating neuroplasticity and how alterations in their expression may contribute to the disconnectivity observed in schizophrenia. Moreover, this review highlights how many of these risk genes converge to regulate common neurotransmitter systems and signaling pathways. Future studies aimed at elucidating the functions of these risk genes will provide new insights into the pathophysiology of schizophrenia and will likely lead to the nomination of novel therapeutic targets for restoring proper synaptic connectivity in the brain in schizophrenia and related disorders. The N-methyl-D-aspartate receptor (NMDAR) and α-amino-3-hydroxyl-5-methyl-4-isoxazole-propionate receptor (AMPAR) are ionotropic glutamate receptors responsible for excitatory neurotransmission in the brain. These excitatory synapses are found on dendritic spines, with the abundance of receptors concentrated at the postsynaptic density (PSD). We utilized two genetic mouse models, the serine racemase knockout (SR−/−) and the glycine transporter subtype 1 heterozygote mutant (GlyT1+/−), to determine how constitutive NMDAR hypo- and hyperfunction, respectively, affect the glutamate receptor composition of the PSD in the hippocampus and prefrontal cortex (PFC). Using cellular fractionation, we found that SR−/− mice had elevated protein levels of NR1 and NR2A NMDAR subunits specifically in the PSD-enriched fraction from the hippocampus, but not from the PFC. There were no changes in the amounts of AMPAR subunits (GluR1, GluR2), or PSD protein of 95 kDa (PSD95) in either brain region. GlyT1+/− mice also had elevated protein expression of NR1 and NR2A subunits in the PSD, as well as an increase in total protein. Moreover, GlyT1+/− mice had elevated amounts of GluR1 and GluR2 in the PSD, and higher total amounts of GluR1. Similar to SR−/− mice, there were no protein changes observed in the PFC. These findings illustrate the complexity of synaptic adaptation to altered NMDAR function. then elevate hypothalamic IL-1 levels, stimulating the CRH neurons. and plasticity show that IL-1 mediates the detrimental effects of stress on memory, and that GCs are involved in both the detrimental and the beneficial effects of IL-1 on memory formation. Based on these studies, the following model is proposed: stressful stimuli induce an increase in brain IL-1 levels, which in turn contributes to the activation of the HPA axis. Subsequently, the secretion of GCs affects memory and plasticity processes in an inverted U-shaped pattern. Over the past two decades it became evident that the immune system plays a central role in modulating learning, memory and neural plasticity. Under normal quiescent conditions, immune mechanisms are activated by environmental/psychological stimuli and positively regulate the remodeling of neural circuits, promoting memory consolidation, hippocampal long-term potentiation (LTP) and neurogenesis. associated with normal aging as well as neurodegenerative and neuropsychiatric diseases. conditions the delicate physiological balance between immune and neural processes is disrupted, resulting in neuronal hyperexcitability, hormonal aberrant ions, reduced neurotrophic factors production and suppressed neurogenesis, leading to impairments in learning, memory and neuroplasticity. A systemic model of the beneficial role of immune processes in behavioral and neural plasticity. Learning, memory and synaptic plasticity involve neural activation of hippocampal circuits by glutamatergic inputs that originate mainly in multiple cortical areas. Long-term memory consolidation also requires emotional (limbic) activation (particularly of the amygdala and hypothalamus), inducing a mild stressful condition, which in turn results in HPA axis and sympathetic nervous system (SNS) stimulation. The peripheral organs that are the targets of these systems (e.g., the adrenal glad, heart, blood vessels and gastrointestinal (GI) tract), in turn, send afferent inputs to the brain that culminate in stimulation of receptors for glucocorticoids, norepinephrine, dopamine and serotonin on hippocampal cells. These inputs are critical for memory consolidation, neural plasticity and neurogenesis. 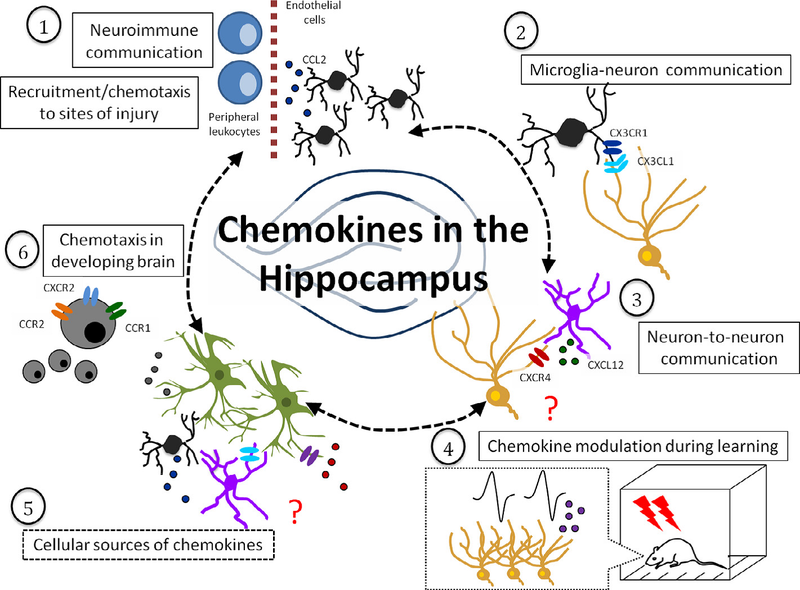 Furthermore, these inputs induce the production of IL-1, and possibly other cytokines, chemokines and immune mediators in the hippocampus, as well as in other brain areas (such as the hypothalamus and brain stem) that are critically important for neurobehavioral plasticity. Moreover, these cytokines, in turn further activate the HPA axis and SNS, thus participating in a brain-to-body-to-brain reverberating feedback loops.